Like the tree? Yeah, it’s not ours (the non-papered walls should have been a dead giveaway that it’s not even our house). 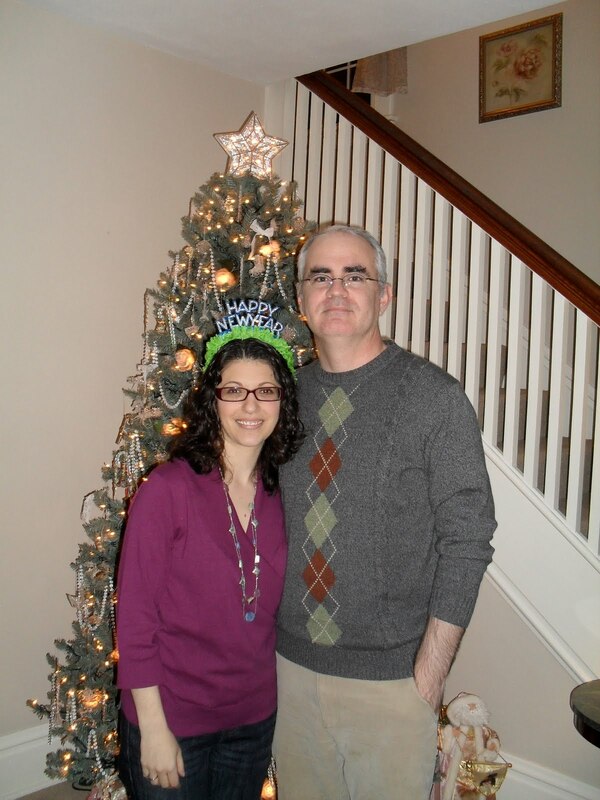 The Great Christmas Fail of 2009 resulted in us snapping pictures in front of everyone else’s trees this year. Fortunately, we actually know the owner of this one. Today, I did not take down the holiday decorations. Nor did I clean the mess that Wilton threw up all over my kitchen last night. And most importantly, I did not make any resolutions. I will not promise to work out everyday, cut sweets out of my diet, keep the house clean, spend less money, or wash my car more often. Why set myself up for failure? But what I will do is pick One Little Word (a dangerous exercise for a wordophile). My word for 2009 was relax. If I had to grade my success, I’d give myself a C+ (I’ll probably have to ask Hubby to grade on a curve). I certainly still have a lot to learn about unwinding, but I did a much better job of “not sweating the small stuff.” This year, the word is try. I hope 2010 is a happy and healthy one for you all! My one little word is “accept.” I think I do a lot of wishing/hoping/waiting and need to just take it as it is and make the best of what I have. my one little word is MORE-love more, laugh more, more patience…i think that will do me well. thanks for this great post cheryl and have a happy new year! I love this idea! And I love your word – I could have said it for myself, too. 🙂 But, I thought of a different one – and I did my own. Thanks for sharing!! !